"There is recognition worldwide that there are advantages to building a closed fuel cycle nuclear industry, as India has championed..."
One of the most important technological enterprises India has undertaken since Independence is now treading its last mile towards completion and commissioning. Called the Prototype Fast Breeder Reactor (PFBR), it is expected to go critical in September 2014, around the very time India’s Mars Orbiter reaches orbit around the Red Planet. When the PFBR goes critical, India will have entered the second phase of a three-stage nuclear programme, the visionary plan for which was laid as far back as 1958 by Homi Jehangir Bhabha, the ‘Father of the Indian nuclear programme’. It will also have become a world leader in an area of advanced nuclear technology, by sheer determination and persistence, through 60 years of having had to build our nuclear industry from scratch and in the face of sanctions and other difficulties. Many advanced countries — including the US, the UK, France, and, Japan — have tried fast breeder reactor technology, and have given up, at least for the time being– some citing economic reasons, others because they were not able to surmount technological complexities, or faced public misgivings. The Ontario Energy Board (OEB) has posted a report from favoured consultant Navigant on the impacts of time-of-use pricing which accompanied the roll-out of smart meters in Ontario. Navigant’s analysis shows that residential consumers reduced their summer on- peak and mid-peak usage by an average of -3.3% and -2.2%, respectively. Off- peak weekday and weekend consumption increased an average 1.2% and 1.9%, respectively. There was minimal conservation response attributable to TOU rates in the summer period. • Winter residential demand decreased in all TOU periods. These reductions ranged from -3.9% to -3.4% in the mid-peak and on-peak periods, respectively. Off-peak weekday and weekend consumption was also reduced by -2.5% and -1.2%, respectively. These estimates indicate that some of the load reduction could be attributed to conservation in response to TOU rates in the winter period. Americans are buying less electricity. That’s a big problem for utilities. 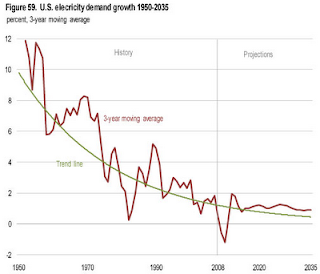 A poor article, from the Washington Post's Wonkblog, on declining electricity consumption. Something very unusual has been happening to the U.S. electricity sector over the past three years. ...it's a massive break from the past. Ever since World War II, electricity sales in the United States have, for the most part, gone up and up and up. The U.S. Energy Information Administration's Annual Energy Outlook with Projections to 2035 contains a graph which is very similar to Ontario's long term demand growth change. It is less pronounced, probably as the U.S. had a population shift to the south due to the widespread use of air conditioning. Regardless, the U.S. forecasting doesn't have the trend magically adjust in 2015, and does seem to be headed to where Ontario arrived back around 2002 – which is no growth. It's a deliberate act of illiteracy to interpret the long-term trend as "up and up and up." Frak'n gas, short term plans, A Russion reactor in Finland, and provincial electricity pricing. Donald Jones has a new article that looks at the emissions and energy security issues of Ontario's latest energy plan. With the increasing demand for non-renewable frackgas the effect of short and long term supply shortages and price increases on the space heating needs of homeowners and industry must be examined. Using frackgas for heating and for electricity generation in North America should be an obvious life and death concern given Ontario's cold winters. A "short" term plan would be to stop using frackgas for electricity generation to ensure supplies for home heating. In Quebec, reports Quebec might need to import power to meet peak demand is noted by Alain Dubuc in advocating for a switch from electric to gas heating. Nominally environmental, allegedly non-governmental, organization Environmental Defence has an op-ed on the Ottawa Citizen site - written by its executive, director Tim Gray. The NGO associated with frac gas promises to correct the "dubious assumptions rather than facts" behind a claim that "green power" is responsible for rising electricity bills. 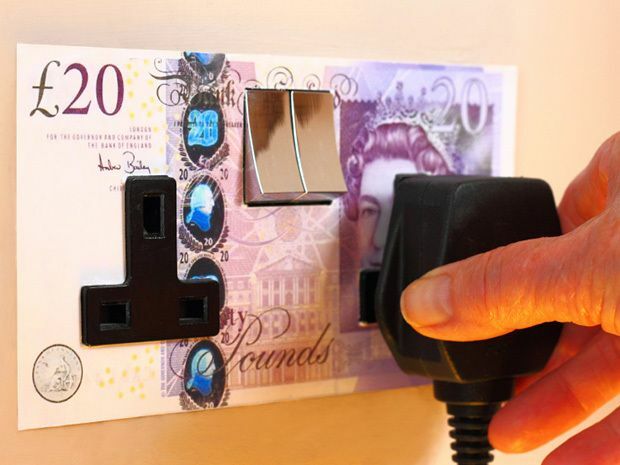 Electricity rates didn't go up 43% last year. I know what Gray probably meant - it's wrong too. 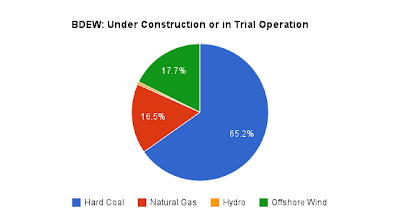 Today, wind and solar produce just four per cent of Ontario’s electricity, so blaming them for rising rates is like blaming the cookie you ate for all your weight gain. Page 20 of "Calculating the RPP Supply Cost"
If you hadn't gained weight on your existing diet, and then you only added cookies to the diet, without changing your energy use, the weight gain would probably be because of the cookies. George Monbiot is always worth a read, and I'm always interested in his writings on nuclear - and coal. His latest is good until the end, where I think it's great. You don’t have to be an enthusiast for atomic energy to see that it scarcely features as a health risk beside its rival. I wonder whether the nuclear panic might be a way of not seeing. Displacement is something we all do: fixing on something small to avoid engaging with something big. Coal, on which industrialism was built, which over the past 200 years has come to seem central to our identity, is an industry much bigger and nastier and more embedded than the one we have chosen to fear. I don’t believe our choice is accidental. Speaking of "fixing on something small to avoid engaging with something big" let's look at the weekend news out of Germany. Clean Sweden's Vattenfall, king of dirty German lignite, is paying a newly elected politician who consequently gets a coalition agreement calling lignite a "bridge"
For a first-time lawmaker, coal promoter Ulrich Freese made the most ofChancellor Angela Merkel’s pledge to counter rising power prices. Freese, a Social Democrat former mining-union executive, won a parliamentary seat on Sept. 22, even as Merkel’s bloc defeated his party in national elections. As the two sides negotiated a coalition government, he inserted a commitment to use lignite, one of the most polluting forms of coal, to bridge the gap in Germany’s energy mix and rein in the second-highestelectricity prices in the European Union after Denmark’s. That meshes with Vattenfall’s plan to extend strip mining in eastern Germany’s Lusatia region, some 150 kilometers (94 miles) southeast of Berlin, where more than 80 villages have been demolished and residents resettled to extract lignite. TOKYO — Japan should continue to use nuclear power as a key energy source despite the Fukushima power plant disaster, a government panel said Friday in a reversal of a phase-out plan by the previous government. The draft energy plan issued by the panel underscores Prime Minister Shinzo Abe’s push to restart as many nuclear reactors as possible under new, stricter safety requirements that took effect this past summer. Allison Macfarlane, head of the Nuclear Regulatory Commission, said in Tokyo that developing an underground repository remains a challenge despite a global consensus on the need for such facilities to deal with waste from nuclear plants. “In the nuclear community, we of course have to face the reality of the end product — spent fuel,” Macfarlane said. CANDU (CANada Deuterium Uranium) reactors have been built in 7 countries. Recent news stories show 5 of those countries are actively growing their nuclear industries, while one is actively working against it. WITH the groundbreaking of what is intended to be Pakistan’s largest civilian nuclear power facility in Karachi last week, a practical step has been taken to help meet this country’s ravenous power demand through nuclear technology.